If you come from the other side of this website, you can see my interest in kayaking and the craftsmanship of working with wood. I have always been interested in boats, harbors and the beauty that we enjoy on the east coast of the US where maritime heritage has a history that is abundant with beauty. I think all artists have a passion for things that are old as well as the simple landscapes that draw us to them. So, my interest in painting is just a simple involvement with these heart-felt emotions. In 1966 I graduated from the Silvermine College of Art. I continued my art education at the University of Bridgeport where I graduated from the school of Graphic Design. Although fine art painting always remained a dominate force, I worked in Advertising Agencies and Graphic Design studios where I did a substantial amount of illustration from simple hands holding tools to the more complex full color renderings of situations and events. This was the pre-computer era where Graphic Design relied heavily on the ability to render and conceptualize on paper and work with inks and markers. From the early seventies on, I was still involved with my fine art paintings working in oil as well as water based mediums both opaque and transparent. I used to sell my paintings at the outdoor shows that are still common everywhere. There weren't many galleries then and fine artists pretty much relied on many obscure outlets to get work seen. I was actually attending Silvermine when Acrylics were introduced in 1965. I remember the Aquatec salesman doing a presentation for the school. It's actually interesting that the bias and suspicion about Acrylics by painting traditionalists still exist today as they did on that one day. For over 25 years, I have visited Rockport and Gloucester, MA to indulge in Art and it still remains one of my favorite places for that type of rocky seacoast beauty and fishing heritage. I also very much enjoy the quiet inland landscape as well and many of my works take me to quiet fields and battered old farms. However, a old fishing boat just cannot be passed by. 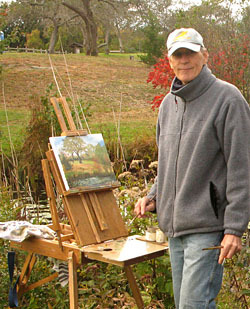 I'm a member of many Art Associations and have had many one-person shows over the years. Being active in art is a way to grow and learn from others. My personal heart felt goals about art is not making paintings to sell but to quench and fulfill my desire to paint, improve my techniques and create personal images that I find beautiful. As artists, we are simply gifted with the prime distinction as viewers of detail. The rotten tree stump that everyone walks by, stops us in our tracks and is fuel for our relationship and appreciation of nature and it's beauty. However as artists, it somehow makes us want to hold on to it or at least try to capture its details for a fleeting moment. Absorbing these details does not mean you have to paint that way, but without them, we can only smell the roses.